Rosie Huntington-Whiteley is featured in an editorial donning next season’s designs entitled “Spring Forward” in the December 2011 issue of Harper’s Bazaar shot by photographer Greg Kadel and styled by Katie Mossman. Rosie‘s in a dress and carrying a bag by Giorgio Armani, Langoliers earrings, and a 2-piece necklace with the top by Etro and the bottom is by Dinosaur Designs. 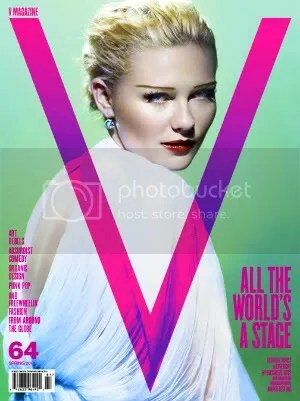 For the spring 2010 issue of V Magazine, none other than the gorgeous 28-year-old blonde bombshell Kirsten Dunst graces the cover as well as a spread entitled “The Art of Being Kirsten Dunst”. Channeling old Hollywood glamour styled by Gaga’s stylist Nicola Formichetti, Kirsten looks absolutely gorgeous in these designs with lace and feathers to glimmering jewels shot by photographer Mario Testino. Top, DIOR. Skirt, AZZEDINE ALAIA. Shoes, CHANEL. 21-year-old Lithuanian model Edita Vilkeviciute shows that there can be beauty and high fashion in the “Wild Country” shot by photographer Nathaniel Goldberg. From chickens and bunny rabbits to baby lambs and horses, stylist Ludivine Poiblanc dressed Edita in soft yet rustic designs as she gets up close and personal with her new farm animal friends for a very elegant editorial. Jacket, skirt, gloves, clutch, GIORGIO ARMANI. Earrings, bracelet, ALEXIS BITTAR. Sweater, blouse with scarf, pants, belt, shoes, CÉLINE. Earrings, ALEXIS BITTAR. Bracelet, TOM BINNS. 17-year-old Hungarian newcomer Barbara Palvin looks quite graceful presenting the upcoming seasons looks in a gorgeous seaside location. I am loving all the blacks and reds in this spread. Embodying a fashionable business woman, my favorite Asian model 22-year-old Chinese Liu Wen is featured in this editorial entitled “Dress For Success” for the upcoming issue of Vogue China with 35-year-old Taiwanese America singer Stanley Huang in some of this season’s sleekest suits. They both look so chic for a simple and straightforward editorial that I really enjoy. For this spring season, seven trends that you cannot go without are the little white dress, military-inspired pieces, under garments as outerwear, bright suits, scissor slits, the new trench, and threadbare.